Update: Cingular pulled the phone shortly after this post. Look for it again on November 15th... As expected, Cingular Wireless has launched the Motorola RAZR V3. The super-thin flip phone is now listed on online sales for most markets. 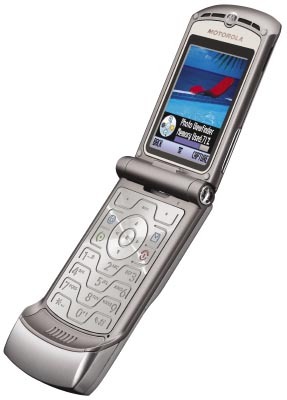 Expect to pay $499 and sign a contract to get the RAZR. Here are some specs: * VGA resolution camera with 4x zoom, image quality options, and auto-timer * Bluetooth * Speakerphone * Only one half inch thick while closed * Quad-band GSM Despite being a quad-band handset, Cingular has an exclusive with the Motorola RAZR V3 in the United States. We first reported Cingular would carry this handset back in early September, about a month after the phone was officially announced. Click on phone thumbnail at right to view in a larger format.